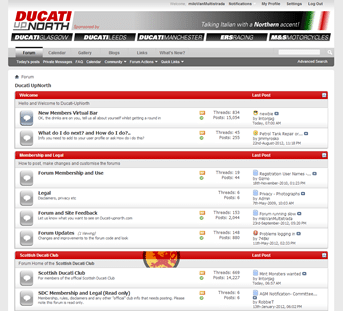 Ducati UpNorth is a long standing owners forum for Ducati motorcycles in the north of the UK. The forum runs on vBulletin software and needed an update to the latest supported version; additionally the hosting provider was proving unsatisfactory and the forum was to be moved to another host. With an established user base of over 2,000 it was important the transition to the new forum version and hosting company went smoothly, we migrated the forum with minimum downtime (under 2 hours). The new forum skin was developed with a desktop and mobile version. Finally, a new logo was created with solid colours for easy printing on t-shirts and other merchandise, and the forum banner was designed to incorporate the sponsor names without taking up too much space on each page.